I am a wife, a mom, a bike rider/racer and a sales rep for a cycling apparel company in St. Paul, MN; Podiumwear. I live and work from home in St. Cloud, MN where I am very active in our local cycling community advocating, building and maintaining off road cycling trails. I also help with grooming and maintaining the Nordic Ski Trails. 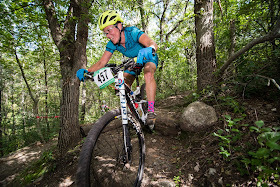 I am a retired Professional Mountain bike racer that has recently started back to racing when it's convenient for the family. I retired in the spring of 2010 due to some back issues. After having our son Aunders in July of 2011 I have been able to get back on the bike and have some fun riding and racing. We've shared the love of bicycles with Aunders on several family bike tours (2 in Denmark) and we get out a lot together on the local trails. It's been fun sharing this with him and everything out doors that we love. I also helped start the local HS mountain bike team here in St. Cloud, St. Cloud Composite team and hope to continue to find time to ride and train with this team. I love working with cyclists of all ages at skills clinics and get really excited when the riders gain the confidence needed to navigate the trail or a technical feature that challenges them. Thankfully I've always had a bicycle to pedal around on and it was really my main mode of transportation growing up. Unfortunately I lost my way a little when I got my drivers license in my late teens but I found my way again after breaking my knee snowboarding at Big Sky while living in Bozeman, MT and needing a cheap way for re-hab, I borrowed a trainer from a co-worker and got to pedaling. That summer I won my first Sport race in mens and womens at Maverick Mtn in Dillon, MT, The Phun Hog Classic. Ever since riding has been a big part of my daily life. Take us back to your first few mountain bike rides. What did you learn and what inspired you to keep at it? Keep up with the group so you know where you need to turn. Also keep up in case your bottom bracket and crank suddenly come out of your bike on a rocky descent which somehow happened to me in MT in 1996! You need people to help you out! The World Cup at Mount St. Anne Quebec. I had some really fun and great results in the World Cup finals and Marathon in the early 2000's and loved the technical and muddy trails. I like to push myself to the limit and it's great when it comes together. Even training or touring it's amazing how that mindset pushes you to ride harder. You raced professionally for awhile- what did you learn while racing professionally? Do you have any tips or suggestions for folks who are on the fence about participating in an event? Do it but keep it fun. If you win it's obviously more fun but just being out and riding is winning versus what most people do on a given Saturday or Sunday. Clips or flats, what do you like best? Clips - Clips but I did race flats (with toe clips) to a few Expert wins back in the day! Crashing is tough, in training it's one thing but I have to admit my most memorable crashes have been while racing. Yes, that's bike racing but when you travel across the country to compete, ruin equipment, bang up your body and see hours of preparation and money go down the drain it's really tough on an athlete. Flying off my bike at a National MTB race in Tennessee and separating my collarbone is up there on the list and being crashed out in the first turn of the Iceman, breaking my helmet, loosing a ton of skin and not having the race I envisioned is second. When you started out riding, what were some handling skills that challenged you? Do you have any suggestions for what helped you grasp them? I learned really quickly that the faster you descend the better, as that is the only way to keep up with the group I started with in MT! Honestly that has helped me out a ton throughout my career. Gotten a few flats because of it but descending has always been one of my strong suits. My technical skills are usually the point that gives me confidence but sometimes my training or fitness is the more limiting factor. I go into an event with a whatever attitude and that helps a ton. I prefer to keep my two wheels on the ground but I do enjoy a little air time here and there again. If you don't go beyond Super D you will be OK with that. I have ridden Cannondale since 2005 and love the geometry and feel. Right now I am riding a Scalpel Mtb (specific model has been chosen because it matches my shoes :)), the lefty is strange on the first ride but then it's a great balanced ride. My bike is light and fast and the suspension keeps the back injury that caused me to retire in 2010 mostly at bay. My road bike is a Cannondale Synapse, I love this bike, you can ride it like a mountain bike or a road bike, it's your choice. It allows for a larger tire for gravel races and the geometry is very accommodating. My "Mom Bike" is a Salsa Fargo and this baby has been a lot of places and pulled my son for the last 6 years. Bike touring, paved trails, single track, it does it all! Not the worlds lightest bike but very comfortable and sturdy! I am the outside Sale Rep for Podiumwear Custom Sports Apparel and have worked for Reid and Jessica since Jan of 2012. Everyone at Podiumwear rides and we have great camaraderie. I get out and use the product we make everyday and I think we have the best custom cycling apparel and customer service of any company. Our women's apparel is the most comfortable apparel I've ever ridden in or worn and I love that I get to assist with it's development. If you enjoy your job, it shows up in your customer service and makes everyone happy! You've also helped out with the local HS cycling team. Why do you feel cycling for young folks in school is such a positive thing? Cycling is what got me grounded back in the 90's and represents a great way to get people into nature and the real world. I love to see kids try new things and fall in love with the bike. It's pretty rewarding. I also spend a lot of time maintaining and building trails here in St. Cloud, MN. The Mid MN Cycling Club will host the 11th Annual Single Track Escape, a MN MTB Series event on June 25, 2017 and the second race of the MN NICA League race September 10, 2017. It's pretty special to see so many people enjoying the trails I have built and maintained over the years! Intimidation but in reality it's just dirt. Crashing in a time trial at a triathlon has to be a lot worse! Having equal prizes at races and equal press coverage would be a great start. 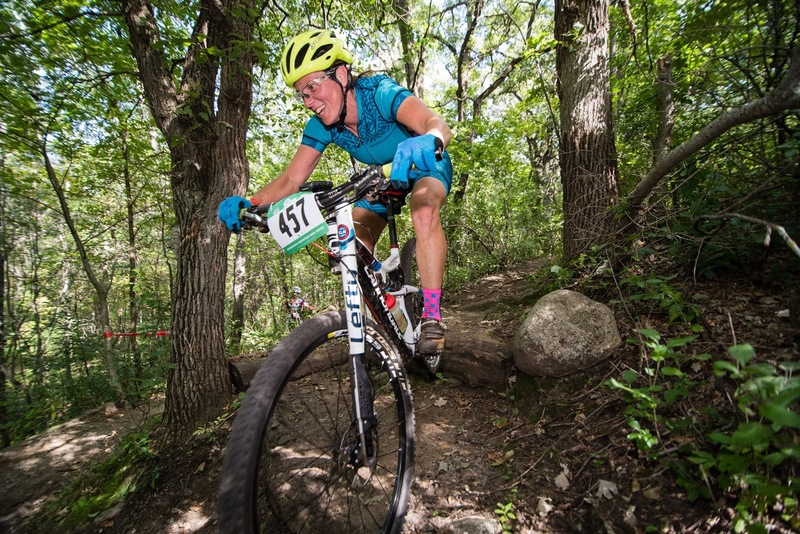 Women's group rides and skills clinics are a great start for many women as well. I love to share the awesome sport of mountain biking. It's really gratifying to work with women in clinics and see them gain confidence that their initial inhibitions keep them from getting. Usually if somebody tries it they will get it and get better. It doesn't matter who it is I think the world would be a better place if we all had a more grounded and understanding perspective!